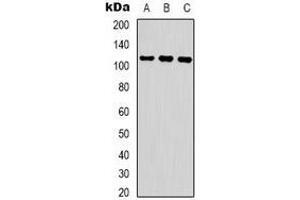 Western blot analysis of COP1 (pS387) expression in Jurkat UV-treated (A), 293 UV-treated (B), K562 UV-treated (C) whole cell lysates. Specificity Recognizes endogenous levels of COP1 (pS387) protein. Immunogen KLH-conjugated synthetic peptide encompassing a sequence within the center region of human COP1. Buffer Liquid in PBS, pH 7.3, 0.2 % BSA, and 0.02 % sodium azide.